Greg was appointed by the Board of Directors (Board) as the General Manager in 2013. 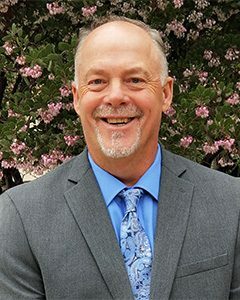 Under the direction of the Board, he provides leadership, management, and planning for all aspects of the District’s day-to-day business for both water and fire operations. Greg represents Rincon Water before local, regional, state, and federal agencies while implementing the directives, policies, and goals of the Board. Clint came on board at Rincon Water in 2001. As the Director of Engineering and Operations, Clint is responsible for planning, directing, managing, and overseeing the activities of the Engineering and Operations Departments. This includes construction, maintenance, operation, and engineering of Rincon Water’s potable and recycled water distribution systems. Jeff is Rincon Water’s newest executive team member as of 2017. As the Director of Administration and Finance, Jeff is responsible for planning, directing, managing, and overseeing the administration and finance activities and operations. This includes accounting, customer service, risk management, purchasing, contracts, information management, and human resources.